ELECTION DAY - Rep. Colton Moore drove the Kemp Truck across North Georgia to rally up last minute voters. Colton spoke directly with Brian Kemp and under his direction, Colton traveled 242 miles, passing more than 200,000 people across the State on Election Day. Brian Kemp and Geoff Duncan are hardworking Georgians that will make a great difference in our State. It has been an honor working with them to create awareness across North Georgia. 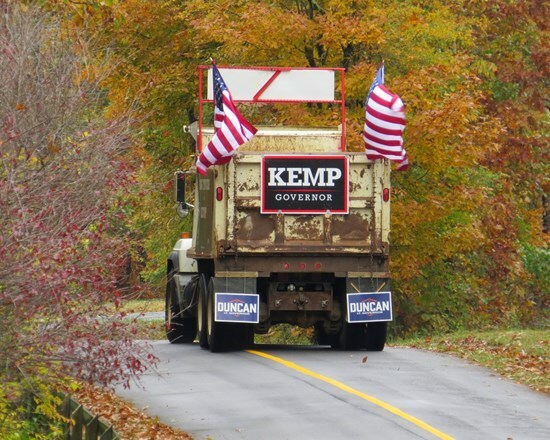 Thank you to Mr. Ken Pennington for capturing the maiden voyage of the Kemp Truck leaving Lookout Mountain, GA. Please enjoy all of our resources, below.